■ 1) KESS V5.017 support car/truck/tractor/Bike. KESS V5.017 supports both 12V and 24V vehicles. KESS V5.017 can support newer vehicles. 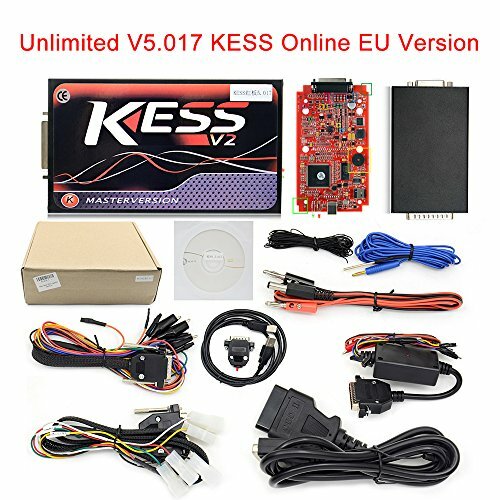 ■ 2) KESS V5.017 is 1000% no tokens limited for all compatible vehicles ! You can use it in anytime. ■ 3) KESS V5.017 is fully open to all protocols such as EDC17/k-line/DSG/DQ200 DQ250 DQ500 Gearbox/ST10........, No Grey protocols anymore. ■ 4) KESS 5.017 read and write ECU via OBD easily, Do not need to disassemble ECU. ■ 5) KESS 5.017 software is very easy to install, just click: Next Step, then it can works well. ■ 6) KESS 5.017 can connect internet ! Support Online Operation! ■ 7) KESS 5.017 support more 140 protocols than KESS V4.036. ■ 1. Please do not update this tool online, or It will be damaged. ■ 2. You can connect it with internet when you use it. and it will not damage the hardware. ■ 3. You have to connect with your car when you install the sw.(Otherwise sw can't be installed successfully). Support Multi-languages: English, German, Spanish, Italian, Portuguese, French.